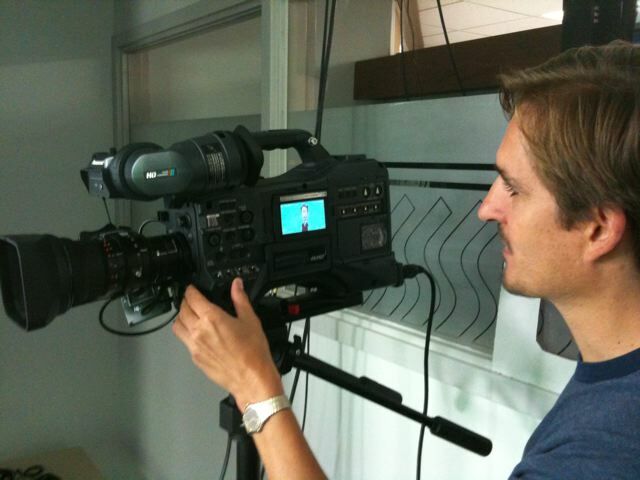 For you production guys, the new camera is a Panasonic HPX-300, replacing our old HVX-200. Obviously the new camera is much better than the old, because "300" is a bigger number than "200." So it's at least 50% better. And "P" is a better letter than "V," because "P" stands for "Phil." And that's me. You may be asking, "Hey Phil – how did you guys buy a new camera? Aren't you broke and penniless trying to land your new deals to keep JellyTelly going?" Well, that's the other part of the celebration on "New Camera" day. We've got funding for JellyTelly! After about 5 months of searching and proposing and negotiating, we've recently signed two deals with two major partners that will keep JellyTelly and Jellyfish Labs going and growing for at least another 2-3 years! Whoohoo! That's almost as exciting as a new camera! Wait – it's MORE exciting than a new camera! Yay! Btw, “V” stands for Vischer.. Does this mean we’ll see more Pirate Guides to Church History soon? Looking forward toward what’s to come! Congrats on the new camera/funding! Can’t wait to see more JellyTelly! This is SO GREAT!!! My daughter (who is 5) will gladly sacrifice other TV time just to watch JT even though she gets less time (she only gets to watch one show a day) and watches something she has now seen a million (ok, tens) of times. Excited to hear about the future!! We’ve been following this crazy adventure of yours and praying for you every step of the way. WOOOHHOOOOOO!!!!! God is good. Congrats. We will from now celebrate 9/9 as Happy “New Camera” Day! Good job phil!! I really want to see what comes from your Jellytelly factory! and tht’s a sweet camera, man. I’m jealous. Awesome!!!!! I love it!!! I keep praying for more new shows so we can bump some of the old re-runs off!!! And now, as long a Mr. Phil has the time, we get to have more shows with more funding!!! What wonderful news! I’m so happy you have funding (and a new camera!). Praise God! That’s good news! Can’t wait to see what you do next! Cool! Praise God! Funding, and a new camera, gettin’ spiffy! Oh, by the way, will you be selling your old camera? And I was liking our Panasonic HMC-150……. Did you happen to look all through the wrapping in the bottom of the box? Maybe there was Another, Extra Camera in there that you wouldn’t want….? Actually a serious question…. what is available on DVD from JellyTelly (or when) & what are the JT fiscal details if we can get interest in having a Christian Film Festival here? If we could show things like JT, the Rondina’s “Jericho” w/ LEGOs as well as local material, perhaps that could help with advertising, getting more material in front of people, perhaps some good fiscal arrangement? Phil and company that is great news and can’t to for you to be able to share more about the 2-3 year blessings! I cant wait until you tell us who the partners are!!!! I’ve been checking every day! Okay, I seen in the Clubhouse by Foucus on the Family magizine there are some awesome ads for jellytelly. THat may be one!